In Wonders of the Solar System, Brain Cox explains things scientists know about the past, present and future of our extended habitat. This series consists of five episodes, each being led by a theme, such as how order was created out of chaos, why we have an atmosphere protecting us or the possibility of life on other planets. It was followed by Wonders of the Universe, which I haven’t checked out yet. 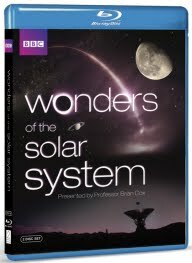 I mostly bought the first series on BluRay because I figured it would be informative and more importantly, because it would look awesome in HiDef, along the lines of the BBC Earth and BBC Life series. Brian Cox is the Jamie Oliver of the scientific world, be it a bit less of a bloke and a bit more of a geek (even though he used to play keyboard for D:Ream, which is of course very cool). He is one of those ‘nice boys’ who would be a big hit with your parents and grandparents. 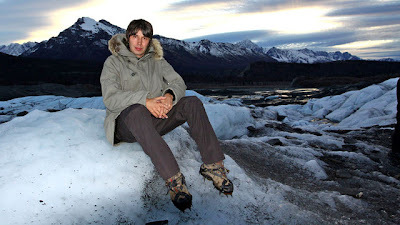 Maybe he is a bit tóó nice even: the wide-eyed, sincere fascination with which he talks about planets and constellations and the physics that hold our universe together is charming generally, but can start to grate when taken in too large a quantity. The words ‘wonder’, ‘wonderful’ and ‘amaayzing’ pop up often and lead to increasing amounts of eye-rolling. There must be a connection between this and the word ‘wonder’ in the title, but I am not sure if he keeps using it to explain why the series is called thusly or if they just figured afterwards: ‘Well, we may as well just stick it in the title.’ In any case, if you manage to get across with images and information how magnificent and ‘amaayzing‘ something is, you don’t need to point it out explicitly every time as well. We get it. His method of showing and telling: travelling around the world to places which illustrate some force at work in the universe at large, possibly aided by placing some grainy photographs around him for further clarification. Occasionally rocks or condiments may be used to create a facsimile of our Solar System. The worldwide locations make for some beautiful imagery, but you can’t help but occasionally scratch your head at the necessity of it. Did Cox really have to travel to the South Pole to show us what a clear, flat piece of ice looks like? Or to a seasonal flower market someplace exotic to show how having seasons impacts life on our planet? It’s the visual sugar that makes the medicine of information go down, but I could have done with a bit more of the second and a little less of the first, great BluRay images or no. If you are going for density of information, a book on the Solar System is a better bet – you will teach yourself more in less time. However, if you have some patience, are visually inclined and are looking for an affable, mild-tempered scientist to tell you interesting things about the universe in a slightly dreamy voice while roaming the planet, then Wonders of the Solar System (and likely its sequel Wonders of the Universe) is where it’s at.